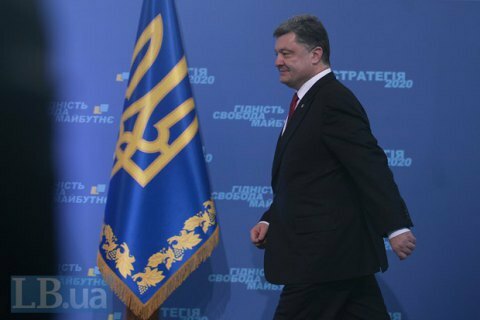 President Petro Poroshenko received the income of 62,163m hryvnyas in 2015 with 121,000 comprising his salary. Another 12,375m hrynvyas comprised the dividends and interests, and 49,665m are written in the column "Other types of incomes" , the declaration of the head of state testifies. The President owns six ground areas over 54,000 m2, a house of 1332 m2, three flats (134,82 and 68 m2). The Ukrainian President has three cars Mercedes-Benz Vito (2010), ВМW 750 LI (2011) and Range Rover (2011). On the bank account Poroshenko has almost 564m hryvnyas. The incomes of the President's family fully comprising their salaries totalled 88,772 hryvnyas in 2015. The family owns a ground area of 2400 m2, a flat of 80,6 m2, a country house of 312 m2 and a garage of 29 m2. Moreover, the family members own the car Jaguar XF 4/2 (2008). The main asset of Poroshenko is a confectionary factory "Roshen." He also owns (complete or in partnership with other businessmen) Sevastopol marine factory (illegally nationalized by occupants), the Kiev factory "Lenin Smithy", the Peskov factory of glass products (Kiev region), the insurance company "Krayina", the International Investment Bank, the accumulator factory "Energy Automatics" in Dnipropetrovsk, the telecommunication firm "Screen" (brand maximum TV). The agrarian holding "Ukrprominvest-Agro" uniting other companies. Poroshenko also produces starch at the firm in Dnipropetrovsk and sells it through LLC "Association Starch Product." Poroshenko owns the sport club "5 Element" in Kiev. The President’s media business is presented by Channel 5, the Truskavets TV company TRT, the radio Niko-FM, Radio5-Retro FV, the Odesa Radio Next and the Drohobych Your Radio.